Buses are a necessary part of Sydney life and can inspire rage and romance- in equal measure. Since starting this project lots of people have been coming forward with their own story from the 428- and we can’t wait to hear more! 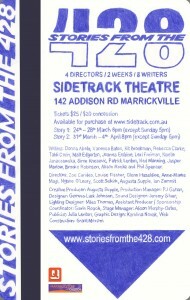 To win 2 tickets to the Sunday28th March and Sunday 4th April performances of Stories from the 428, simply send your story to be published on the Stories From the 428 website by 5pm 21st March 2010 to be in the running for some free tickets! with MY 428 STORY in the headline. There is no limit to style or genre- but there is a word limit- 250 words or less! Winners will be announced the 22nd March via email and on the website! Two groups of playwrights will travel on the 428 bus route from Circular Quay from the 1st February to the 14th February- experiencing the everchanging landscape of the City/Marrickville area and it’s community. From these trips the writers have a 24 hour period within to submit a scene or vignette inspired by the trip- which will be round tabled, developed and curated into a full length play. Frequently funny and sometimes sad, this two week season is a love letter to the local area - written about and for people who experience bus travel as a part of their everyday lives. Penned by some of Sydney’s most celebrated playwrights inconjunction with the best of the emerging underground- this is a unique and diverse theatre project highlighting the importance of community and finding inspiration in the everyday. Vanessa Bates, Kit Brookman, Rebecca Clarke, Sime Knezevic, Ned Manning, Brooke Robinson, Alison Rooke and Phil Spencer. Donna Abela, Tahli Corin, Matt Edgerton, Joanna Erskine, Lexi Frieman, Noelle Janaczewska, Patrick Lenton, Jasper Marlow. To encourage high profile theatre practitioners artists based in the inner-west area to create work for and about the community that. To provide new local theatre writing to the general public. To create a dynamic and nurturing environment for the creation of new work.